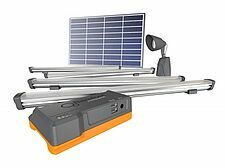 The Barefoot Connect 3000 is a complete solar home lighting system that provides abundant light from 4 LED tube lights and a security light for your safety as well as convenient phone charging. Simple plug-and-play installation does not require an electrician or trained service person. All necessary components are included for a fast, neat and easy installation. High tech controller extends the life of your battery and provides constant power through the USB and 12V outputs.